Top Heats – There were a number of exciting battles throughout the day, but heats 7 and 15 were the two that caught my eye the most. Parko ripping it up in tailor-made conditions for him at a break he’s surfed many many times was no surprise. However, watching Brazilian Neco Padaratz put a couple of very solid waves together was a welcome site as I really see this being a huge year on tour for Neco. Dane Reynolds in heat 15 was everything everyone expected and more. After going for a couple of huge moves early and not quite pulling them out, he settled down and put together one of the most impressive run of waves seen all day. Unfortunately for Dane he was in the same heat as Aussie Luke Munro who was absolutely on fire and put on one of the top performances of the day. Munro finished off his scores with a 9.50 to pull out the win and move on to the 3rd round. Not So Top Heat – Heat 5 ended up being a 2-man event right from the beginning. Trying to rest the leg he injured at Pipe recently, Fred Patacchia was content to paddle out and enjoy some rays for a half-hour while hoping the condition of his leg improves before the second round. With Freddy P taking it easy, it left Andy Irons and french-man Mikael Picon to battle it out for the second-round bye. It may have had something to do with the drilling he took on the rocks earlier in the week, but Irons just did not look himself at all and was visibly frustrated as Picon ended up outsurfing him to take the heat. Although he looked out of sync today, he is A.I. and I’m sure he will be just fine as he moves on through the following rounds. The Rookies – With all of the hype and hoopla surrounding the full-time arrival of Jordy Smith and Dane Reynolds (I’m as guilt of it as any), I was very interested to see how they would hold up under the pressure. While it’s still too early to say and this was only one heat here are my thoughts. Dane easily had the better heat of the two and was really catching his rhythm as the heat progressed. Jordy looked solid early on in his heat but just could not do enough with the waves he caught to catch Luke Stedman. Overall it was an impressive opening to the season by both Reynolds and Smith and both appeared largely unaffected by the pressure. Kelly Slater – Watching Kelly today and seeing him fall a little behind early on in the heat to Rodrigo Dornelles I once again had the same feeling I commonly had when watching the Chicago Bulls during the Jordan-years. With the clock ticking and Slater needing a 6.54 to overtake Dornelles and bypass the second round, Kelly sat calmly in the water and everyone watching knew what was about to happen. With about two minutes left in the heat, Slater ripped off a smooth 7.10 ride to take the heat and move straight into the 3rd round. Just another case of Kelly Slater doing what has made him the living-legend he is. When asked about his plans for the tour beyond the Gold Coast, Slater replied nonchalantly: “Well I got a heat tomorrow or the next day and that’s it, I’m definitely not going to surf all the events, that’s for sure.” Kelly also spent a few heats up in the booth at Snapper announcing with Tom Carroll. With 10 world championships between the two it was great to hear their points of view for a while, especially on the future of Dane Reynolds during his heat. It was also quite entertaining to watch their reactions as the cameraman seemed to increase the shots of backsides of some of the Gold Coast’s finest with Carroll and Slater on the call. Forecast – While the swell that has left over what was surfed on today will continue to diminish, Ben Macartney from Coastalwatch appeared very optimistic about a swell that is building and likely to move through next weekend. The Superbank is in fantastic condition and if this swell comes through as expected it will provide an unbelievable arena for a display of world-class surfing at what will more than likely be Snapper Rocks as the contest moves into the later rounds. 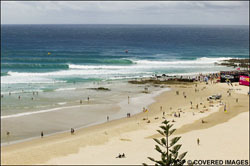 The 2008 ASP World Tour is officially upon us and round 1 of the Quiksilver Pro Gold Coast is officially on and will be starting at 2:00p.m. (PST). Although they held the Komunity Project trials at Snapper Rocks yesterday they have opted to hold the lead-off round at nearby Duranbah with the surf coming in around the 2-4ft range but conditions are clean. I imagine ‘The King’ has to be stoked on D-bah being the call for now. As I mentioned earlier his ‘06 victory, as well as the only victory by a foreigner in this event took place at this location. With just 16 days of the three-month holding period for the Quiksilver Big Wave Invitational In Memory of Eddie Aikau remaining, the mighty Pacific Ocean is bouncing back to life after what has been, to up until this point of the year anyway, an overall disappointing season on the North Shore. The new swell lifted hopes that the event would be able to run today, however it was called off this morning once organizers realized that although the surf was big, it just wasn’t big enough for Eddie. However, with the new found energy being seen in the ocean and large swells forecast for the next week or so, there are still hopes and realistic chances that one of the premier big-wave surfing events in the world will still be able to run this year. Although the swell didn’t materialize to the level that many had hoped for, it did carry enough size and was in the right direction to give the the one-day Quiksilver Edition Ku Ikaika Challenge it’s chance to get going and heats began earlier today. The world’s first big-wave international stand-up paddle surfing competition is being held over at Makaha and will give those jonesing for a big-wave surf contest at the very least something to hold them over until the size is up to par for Eddie’s standards. With over 15,000 big ones at stake and the chance to see some of the worlds best paddle-boarders go at it in heavy surf, the Ku Ikaika presents a great opportunity to those able to make the trek out to the west side of Oahu. The fate of Rusty apparel has been in question since April when R.. & Everything Else Inc, the parent company of Rusty Surfboards and Apparel, canceled their 40 year licensing agreement with C&C Companies. The separation was actually a fairly nasty one and it didn’t seem that C&C wanted to let go. Well, there’s no longer any question as to Rusty’s fate now that the La Jolla Group has acquired the North American license for Rusty apparel and accessories. The La Jolla Group also holds the licensing rights for other major brands in the industry such as O’Neill, Lost, and Metal Mulisha. They have done a pretty solid job with these other brands and Rusty fits right into their culture as a brand with deep roots in surfing from legendary shaper Rusty Preisendorfer. Rusty also supports some of the top surfers in the world, Jamie O’Brien and Josh Kerr. It will be interesting to see the direction Rusty heads over the next few years under the direction of seasoned executive Setzler. Rusty has always struck me as a brand that’s kind of been on-again-off-again throughout the years. I remember some years their apparel was sold in just about every shop in the country and some years they were nowhere to be found. I’ve been hearing a lot of rumors and speculations lately that Quiksilver is looking to dump Rossignol, the ski company they purchased in March of ‘05 for just over $300 million. That doesn’t really come as much surprise seeing that Rossignol posted their first loss in 15 years under Quiksilver’s management. Not to mention that Rossignol doesn’t fit into the Quiksilver culture either. In my opinion, this purchase was never going to be a good fit. Like I just mentioned, Rossignol just isn’t a company that fits into the lifestyle culture of Quiksilver. While they actually make some of the best skis out there, the company’s roots are just too deeply tied into ski racing. If Quiksilver wants to get into the ski game they should acquire a smaller company that’s core in the freestyle sector, someone like Line Skis would be perfect. Although a much smaller company, Line fits perfectly right in with the action sports lifestyle. The company is breed on freestyle and has been a major factor in the innovation of skiing’s comback since the mid ’90s. They’ve been at the forefront with freestyle ski technology and have consistently sponsored and supported some of the sickest athletes in the industry. And although some years their products weren’t exactly the best constructed, that’s something Quiksilver could bring to the table which would help Line to the next level. It’s obvious Quiksilver didn’t really understand the industry they were getting into. One doesn’t need to look any further for proof than the $4.8 million loss they posted in comparison to $3.7 million in profit the year before. The ski community would’ve responded better to Quiksilver’s entrance into the sport through a core company like Line and Quiksilver’s culture should never include ski racing. Sources close in the company are saying that three different offers are on the table for Rossignol. They are also independent rumors that they’ll just dump a few of the companies under Rossignol such as Dynastar, Look and Lange. So what do you think? Should Quiksilver dump Rossignol? I haven’t watched Quiksilvers financials, but I bet the new team of riders that make up the Young Guns are a big part of their coming back to a Core image. Whether they were ever loosing money or not I don’t know but it seems that Quiksilver is coming back as a brand for Surfers as opposed to a brand for barneys from Ohio that have never seen a beach. Their riders are some of the best in the world, and I am not just talking about Kelly Slater. Dane Reynolds, Clay Marzo, and Ry Craike have been laying down some of the sickest sections in the latest videos. Young Guns 3 is no exception. As always when seeing press releases on new products or events for Action Sports companies I am interested in the Online Marketing Campaign. While Young Guns 3 the movie may get an A+ the online marketing promo gets a big fat whopping F-.If you type in Young Guns 3 in Google Quiksilver doesn’t even rank on the first page. Now if you are Quiksilver and you spend hundreds of thousands if not a couple million on creating one of the sickest videos of the summer, don’t you think you would want to own that traffic?There is a site www.youngguns3.com, it is a site that has been up a while and was used as a viral campaign over the last year to get followers to vote on videos of pros and eventually choose who was to star in the new movie. It doesn’t look like it got a ton of traction, honestly it was the first I had heard of it and only because I did the search. BUT and a big BUT at that it still isn’t number one for the Google search. Quiksilver also posted 10 videos on YouTube that were labeled as Pre-Films with clips from the making and some seriously long sick surfing sections from the riders. Most were only getting about 2k views with some with about 10k. Now the surfing industry may not be entirely adapted to online media, but I would expect more views than that. It isn’t very hard to get videos to get over the 100k mark on YouTube. They didn’t even post the videos on their site, and I would think that would bring some serious views and traffic.Also if they would of laid out the Titles and Descriptions right for those videos and then linked to their urls, they would probably have one or two of them ranking in the top ten of Google for both Quiksilver and Young Guns 3. But I guess they wanted no one to see it?Once again a major player in the Action Sports industry falls very short when trying to market online. Can’t somebody get this right?